Dr Sandhu graduated in 1997 from the University of Punjab, Pakistan. She completed her training in Cellular Pathology in the rotation programs of the North Western and North Thames Deaneries. Her training in Cytopathology was mainly in Northwick Park Hospital, the London Regional Cytology Training Centre, and training in Gastrointestinal Pathology was mainly at St Mark's Hospital, a national and international referral centre for intestinal and colorectal disorders, where she had the opportunity work alongside Dr Jeremy Jass. She later worked here as a Locum Consultant in Gastrointestinal Pathology doing routine and referral work with Professor Thomas Guenther. 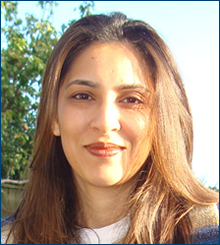 Dr Sandhu was appointed as a Consultant at Warwick Hospital in 2009 where she is lead pathologist for Breast, Urology and Non-Gynae Cytology and cover pathologist for Gastrointestinal Pathology. She participates in the Breast Screening Pathology EQA, Bowel Cancer Screening Program EQA and General Histopathology EQA. Dr Sandhu offers an intra-operative service for assessment of breast sentinel lymph nodes using touch imprint cytology. She has been the pathology representative in a move towards replacing this technique with molecular analysis using OSNA (One Step Nucleic acid Analysis) and is a member of the UK OSNA User Group.